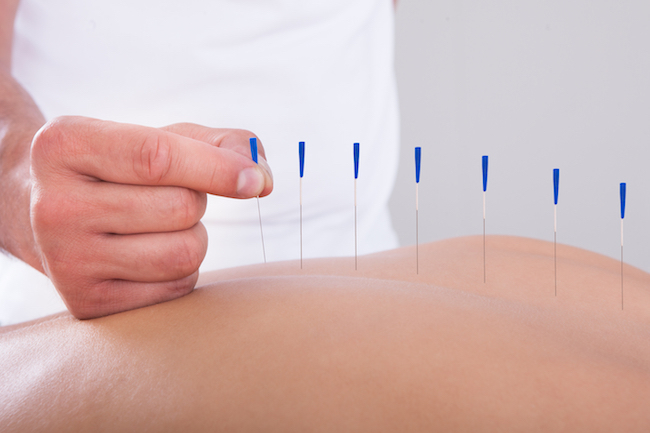 Dry needling is the use of very thin pins to release myofascial trigger points in the muscles. A trigger point is a palpable part of the muscle, which is tight due to the muscle sacromeres being partially crossed over each other but they are in a static state, no longer contracting or relaxing. When the needle penetrates the trigger point, it causes an opening in the sodium and potassium channels, which in turn stimulates a muscle contraction which then allows the sacromeres to slide back over each other and relax. The second way it works is by causing a localised inflammatory response in the muscle, which triggers vasodilatation of the vessels and therefore relaxation of the muscle around the needle. But as the needle are so thin and are removed within 1-2 minutes they do not cause any lasting damage. Dry needling is an effective adjunct to treatment as often trigger points are in the deeper layers of muscle tissue, which we cannot loosen with massage or heat. They are also more specific to the trigger points that are causing the pain and with a lot of people, have a long lasting effect. Dry needling can cause post treatment soreness in some clients but this should only last for 3-4 hours. Some patients experience a dead arm feeling. This obviously depends on the site of the needles. When someone is receiving dry needling it is not a completely pain free experience, they will often feel the needle penetrate the skin, with a slight stinging sensation and then they will either feel a twitch or an ache around the area. The twitch is the best response you can have as it is the trigger point contracting and then relaxing, but if the muscles are very tight or if you put the needle into a lesser trigger point you may only feel a deep ache. This is when the blood is trying to push through the muscle to get to the area, during the inflammatory stage. Once the ache has eased and the client can no longer feel the needle is when you can take it out. 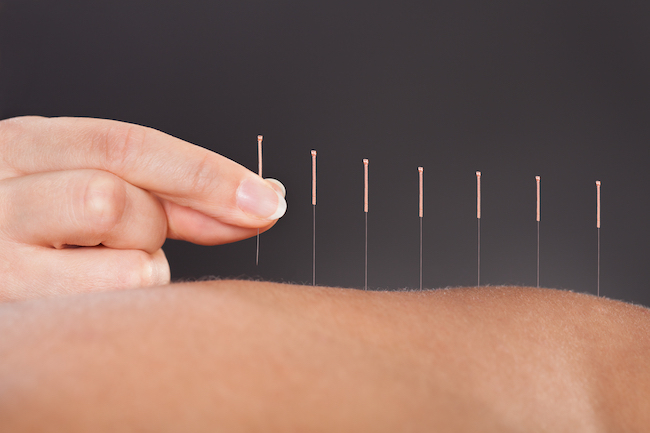 Dry needling differs from Traditional Chinese Acupuncture (TCM) as TCM is based around an ancient spiritual concept and religious beliefs which involves stimulating of acupoints to promote the flow of energy or Qi through the body and the meridian pathways. It is said to promote whole body wellness and is claimed, can help with organ ailments and even the common cold where as dry needling is just used as an adjunct to treatment of the musculoskeletal system. TCM is typically not painful as the needles do not go deep into the muscles and they are often left in the acupoint for long periods of time. There is a high percentage of cross over between the acupoints and common trigger points which suggests there is a relation between the two methods. There have been quite a few studies to establish the effectiveness of dry needling. One of the more recent articles Myoral Et al 2013 is a randomised control trial with single blinding, which aimed to determine if dry needling was more effective than the placebo in the pain management in patients post knee arthroscopy. The Subjects in the dry needling group were needled under anaesthesia before surgery and the control group was not. At the one month follow up the dry needling group had significantly less pain than the control/placebo group, but at the 3 and 6 month follow up the differences were not significant. Therefore this study showed that one dry needling treatment can reduce pain post knee arthroscopy for up to a month. Another study by Tekin et al 2013 (abstract only) investigated the pain reduction effectiveness of dry needling verses sham needling in patients with myofascial pain syndrome. The treatment was composed of six sessions which were performed in 4 weeks; the first four sessions were performed twice a week (for 2 weeks) and the last two, once a week (for 2 weeks). It was found that after the sixth treatment session the VAS pain scores were significantly reduced in the dry needling group when compared to the sham group, it also found Short form 36 scores for the dry needling group were found to be significantly increased in both the physical and mental components, where as the Sham group only had increases in the vitality scores. This suggests that Dry needling is an effective pain reduction technique in myofascial pain patients. Several clinicians at Beechboro Physiotheapy use dry needling. Feel free to call us on 9377 2522 to find out more about dry needling and if it would be of benefit for you.